First is setting up a new transmission/reflection Terahertz Time-domain spectroscopy (THz-TDS) setup using photoconductive antennas (PCA). This involves everything from designing the initial setup and buying the necessary components, to assembling the spectrometer itself and writing the software used for data-collection. In the future additional features will be integrated into the setup, such as being able to do THz-microscopy and/or to do pump-probe spectroscopy. The purpose of this setup is to become an integrated part in the development of novel THz emitters by establishing an experimental basis for characterizing the material properties of carbon-based nanostructures, such as carbon nanotubes and graphene, in order to examine their potential as a THz emitter. Finally, this setup will be used in the collaboration with the other NOTEDEV fellow at the University of Exeter, Vasil Saroka. The second project is to use pump-probe THz time-domain-spectroscopy to investigate the timescales of photoinjection into graphene from adsorbed pyrene sensitizer. We expect to observe some transfer of energy and/or charge carriers from the pyrene to the graphene, which would mean that one can improve the absorption of graphene when photoexciting with wavelengths corresponding to the absorption peaks of the pyrene, i.e. approximately 250nm and 280nm. A part of this project will be to integrate an Optical Parametric Amplifier (OPA) into a current pump-probe THz-TDS setup in order to pump with the desired wavelengths. Lastly, is the investigation of Quasi-metallic Single-Walled Carbon Nanotubes (SWCNT's). SWCNT's can be considered as rolled up sheets of graphene and depending on the way they are "rolled", their electronic properties can change significantly. In recent years, many groups have observed a broad THz resonance in these NT's, and theoretical results suggest various THz applications of these SWCNT's. My work is mainly based on the experimental method known as Optical Pump-THz Probe Time-domain Spectroscopy (OPTP TDS). The experimental setup shown in Figure 1 and a detailed description can be found in (Ulbricht et al. 2011). The main feature of this setup is the ability to probe the non-equilibrium carrier dynamics of various materials, such as carrier mobility and photoconductivity. This is done by measuring the change in the detected THz field, ∆E, a certain time after photo-excitation, ∆τ, see Figure 2. 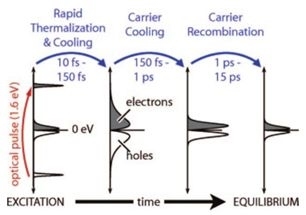 By varying ∆τ, one can measure the time-evolution the photo-excited charge carriers as they are photo-excited, cool and decay in the material. Figure 1:” Schematic representation of an optical pump-THz probe experimental setup. A train of ultrashort laser pulses enters the setup from the upper left corner and is split into three: the excitation beam, and two beams for the generation and detection of THz pulses. A mechanical chopper is placed in either the excitation or generation beam, depending on the type of experiment. 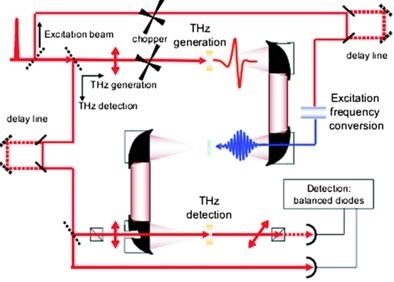 In the balanced detection scheme, the THz field- induced rotation of the polarization of the detection pulse is measured as indicated. Two optical delay lines are used to control the delay times between the three pulses”. Source: (Ulbricht et al. 2011), page 548. Figure 2: Schematic of the pump-probe process and measured change in THz pulse in epitaxial graphene. Source: (George et al. 2008). Uniquely to the setup here in Exeter is the ability to choose the wavelength (280nm - 2800nm) of the excitation beam using an Optical Parametric Amplifier (OPA), which opens up many new experiments such as pumping with a wavelength that corresponds to an absorption peak in the material, or selectively photo-exciting parts of a sample that contains a distribution of materials with different bandgaps. I am currently using this experimental setup to investigate carbon-nanostructures such as graphene and Single-Walled Carbon Nanotubes (SWCNT’s). Despite being only one atom thick, graphene is found to absorb a significant fraction of incident white light, a consequence of graphene’s unique electronic structure (Nair et al. 2008). A subject of great interest within the realm of graphene science is the possibility of using quantum dots and other fluorescent particles to improve the coupling of incoming radiation into graphene even further. Various groups have looked into energy transfer from these optically excited particles to graphene such as (Liu, Liu, and Liu 2011), where they investigate the fluorescence quenching of dyes by graphene using UV-vis absorption spectra, steady state fluorescence spectra and time resolved fluorescence spectra. In (Gaudreau et al. 2013) they investigated the fluorescence intensities and lifetimes of Rhodamine when optically excited and placed close to graphene, where they observe a 1/d4 distance scaling of the energy transfer. In my project I have been fabricating pyrene-thyol-gold-nanoparticles adsorbed to the surface of CVD-graphene and investigating the timescales of the energy transfer, see Figure 3. These nanoparticles have an absorption peak at approx. 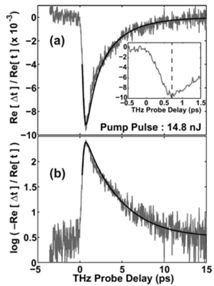 280nm, so by tuning the wavelength of the pump beam on and off this absorption peak, we expect to observe a change in the typical photo-conductivity response observed in graphene, see (George et al. 2008), and Figure 4. Figure 3: Schematic of the pyrene-thyol-gold-nanoparticle sample and the energy-transfer process. Figure 4: Top: “A schematic of the likely processes by which optically excited, nonequilibrium electron and hole distributions approach equilibrium.(…)”. Bottom: Typical measured change in the transmission of the THz pulse, ∆t, vs time delay between THz probe and pump pulse, ∆τ, labelled here as “THz Probe Delay”. Source: (George et al. 2008). A single-walled carbon nanotube (SWCNT) is formed by rolling graphene into a cylinder, where the manner in which the tube is rolled strongly dictates its electronic properties and is described by the chiral vector L, which is defined by the primitive translation vectors a and b of the honeycomb lattice structure, L(n,m) = na+mb ≡ (n,m), where n and m are integers, see Figure 6. If n = m the nanotubes are known as armchair nanotubes, and if m = 0, the nanotubes are called zigzag nanotubes. The rest are known as chiral nanotubes. When n−m = 3p, where p is a non-zero integer, the tubes are called quasi-metallic tubes. We discern between metallic, quasi-metallic nanotubes, and semiconductor nanotubes, since the bandstructure is defined by the way in which the tubes are rolled. Armchair and quasimetallic nanotubes can be considered as a 1D analog of graphene, where the energy spectrum is given by E(k) = ±ℏνFk. The quasimetallic nanotubes are of special interest, since for small diameter tubes (1−2nm), bandgaps in the THz-range appear due to curvature effects (Ouyang et al. 2001), (Duque et al. 2013). In (Portnoi, Kibis, and Rosenau da Costa 2008), they propose various THz application of carbonnanotubes, including generation of THz radiation due to hot electrons. Furthermore, a broad THz resonance has been observed in both semiconducting and metallic nanotubes (Kampfrath et al. 2008). Examining a single type of nanotube proves difficult however due to the way that they are produced. In most cases, when producing carbon nanotubes, the end result is a distribution of tubes with different chiralities, making it difficult to discern the quasimetallic tubes by themselves, since most pump-probe setups photoexcite with 800nm pulses (1.5eV ), which is well above the bandgap of any semiconducting SWCNT’s that one would have for a diameter of a few nanometers (0.5eV -1.0eV approx.). By being able to choose the pump wavelengths in my experiments, I have the option of photoexciting the metallic and quasimetallic NT’s, leaving the semiconducting NT’s unexcited, which allows me to isolate the response from the former. 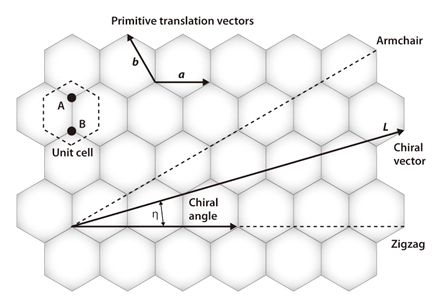 Figure 6: The honeycomb lattice of graphene. The manner in which the graphene sheet is “rolled” determines the electronic properties of the resulting nanotube. Source:(Ando 2009), page 1. Figure 7: Schematic of the bandstructure and density of states of a metallic nanotube (left) and semiconducting carbon nanotube (Right). Source: (Nanot et al. 2012). Throughout the last 6 months I have been building my own free-space THz Time-Domain Spectrometer based on photo-conductive antennas fabricated by a professional manufacturer, BATOP, and the setup is now a fully functioning transmission THz-TDS. The original intention was to use this setup for THz imaging applications, i.e. it would function as a “THz microscope”. However, I have since discovered that this requires a signal to noise ratio that is currently not achievable for this setup. Therefore the new goal of this project is to turn the free-space setup into a fiber-coupled setup with a cryostat, which will enable us to quickly and efficiently perform both transmission and reflection spectroscopy in a low temperature environment. Ando, Tsuneya. 2009. “The Electronic Properties of Graphene and Carbon Nanotubes.” NPG Asia Materials 1 (1). Tokyo Institute of Technology: 17–21. doi:10.1038/asiamat.2009.1. Duque, Juan G, Xiaomin Tu, Ming Zheng, Angela R Hight Walker, Robert H Hauge, Stephen K Doorn, Junichiro Kono, et al. 2013. “Fundamental Optical Processes in Armchair Carbon Nanotubes.” Nanoscale 5 (4). The Royal Society of Chemistry: 1411–39. doi:10.1039/c2nr32769d. Gaudreau, L., K. J. Tielrooij, G. E. D. K. Prawiroatmodjo, J. Osmond, F. J. Garcia de Abajo, F. H. L. Koppens, F J García de Abajo, F. H. L. Koppens, F. J. Garcia de Abajo, and F. H. L. Koppens. 2013. “Universal Distance-Scaling of Non-Radiative Energy Transfer to Graphene.” Nano Letters 13 (5). American Chemical Society: 1–17. doi:10.1021/nl400176b. George, Paul A, Jared Strait, Jahan Dawlaty, Shriram Shivaraman, Mvs Chandrashekhar, Farhan Rana, and Michael G Spencer. 2008. “Ultrafast Optical-Pump Terahertz-Probe Spectroscopy of the Carrier Relaxation and Recombination Dynamics in Epitaxial Graphene.” Nano Letters 8 (12). American Chemical Society: 4248–51. doi:10.1021/nl8019399. Kampfrath, T., K. von Volkmann, C. M. Aguirre, P. Desjardins, R. Martel, M. Krenz, C. Frischkorn, M. Wolf, and L. Perfetti. 2008. “Mechanism of the Far-Infrared Absorption of Carbon-Nanotube Films.” Physical Review Letters 101 (26): 267403. doi:10.1103/PhysRevLett.101.267403. Li, Yan-Hui Hui, Yi Min Zhao, Martin Roe, David Furniss, Yan Qiu Zhu, S. Ravi P Silva, Jin Quan Wei, De Hai Wu, and C. H Patrick Poa. 2006. “In-Plane Large Single-Walled Carbon Nanotube Films: In Situ Synthesis and Field-Emission Properties.” Small 2 (8-9): 1026–30. doi:10.1002/smll.200600080. Liu, Yan, Chun-yan Liu, and Yun Liu. 2011. “Investigation on Fluorescence Quenching of Dyes by Graphite Oxide and Graphene.” Applied Surface Science 257 (13). Elsevier B.V.: 5513–18. doi:10.1016/j.apsusc.2010.12.136. Nair, R R, P Blake, A N Grigorenko, K S Novoselov, T J Booth, T Stauber, N M R Peres, and A K Geim. 2008. “Fine Structure Constant Defines Visual Transparency of Graphene.” Science (New York, N.Y.) 320 (5881): 1308. doi:10.1126/science.1156965. Nanot, Sébastien, Erik H Hároz, Ji-Hee Kim, Robert H Hauge, and Junichiro Kono. 2012. “Optoelectronic Properties of Single-Wall Carbon Nanotubes.” Advanced Materials (Deerfield Beach, Fla.) 24 (36): 4977–94. doi:10.1002/adma.201201751. Ouyang, M, J L Huang, C L Cheung, and C M Lieber. 2001. “Energy Gaps in ‘Metallic’ Single-Walled Carbon Nanotubes.” Science (New York, N.Y.) 292 (5517): 702–5. doi:10.1126/science.1058853. Portnoi, M.E., O.V. Kibis, and M. Rosenau da Costa. 2008. “Terahertz Applications of Carbon Nanotubes.” Superlattices and Microstructures 43 (5-6): 399–407. doi:10.1016/j.spmi.2007.07.026. Ulbricht, Ronald, Euan Hendry, Jie Shan, Tony F. Heinz, and Mischa Bonn. 2011. “Carrier Dynamics in Semiconductors Studied with Time-Resolved Terahertz Spectroscopy.” Reviews of Modern Physics 83 (2): 543–86. doi:10.1103/RevModPhys.83.543.